Looking to hide a little tummy? This cute top with the tie detail in front could be just the ticket! The sleeve length is so flattering too. The lightweight cotton and modal is perfect for hot summer days. Also available in a beautiful blue shade. Size recommendations: I’m wearing a small and usually a size 4 on top. It’s roomy and I could’ve gone with an XS. Loving this batik-inspired diamond print in all these luscious colors! The skirt is so soft and comfortable and easy to wear. This is the misses size small and the length is perfect for me at 5’7″ but the skirt is available in petite, women’s, and tall sizes too! I’m usually a size 6 on the bottom and the small fits nicely with no clinging. J. Jill sent me these pieces to try and review. All words and opinions are all my own as always. How was your Memorial Day weekend, Ladies? This teacher is feeling VERY cheerful about her summer off! Did you shop any sales? I decided on this Steve Madden tote on sale for the Nordstrom’s Half Yearly Sale (going on until June 4th!). I had the hardest time picking one, which isn’t really like me. I blame it on all the super cute styles out right now! Memorial Day weekend means the start of summer to most of us …. so bring on the summer fun!!! I’m on the lookout for a maxi skirt and I love this print!!! I need a top like that! Lol It looks great with your maxi skirt! 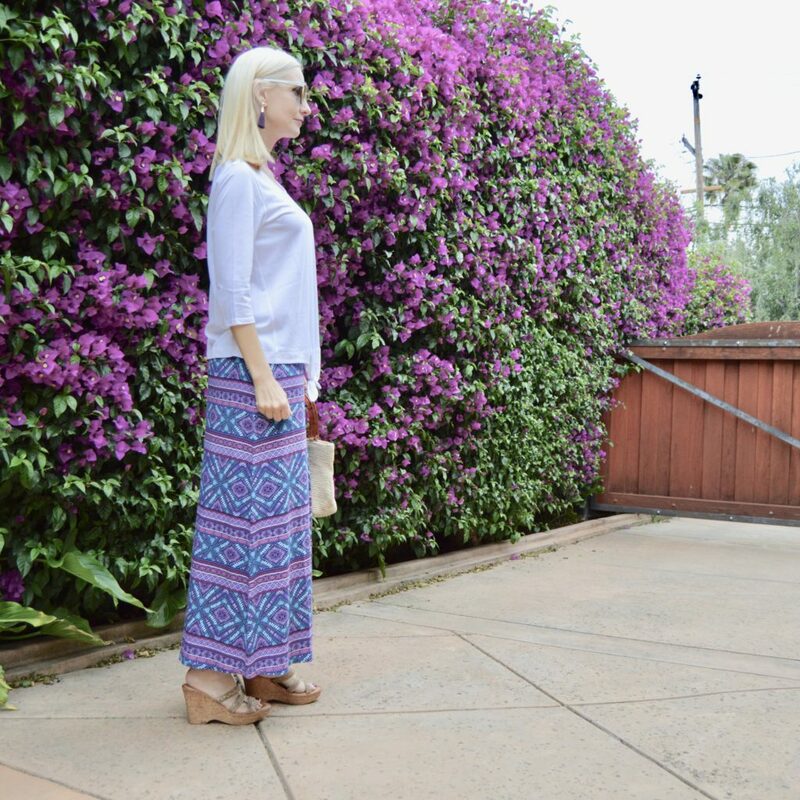 A great print, love a maxi skirt! What a beautiful skirt! And what a stunning backdrop! Such a gorgeous look, Dawn. Love that skirt. So pretty !Love your maxi skirt and the tie detail on your top. Looking gorgeous! Great summer look. You really pull these long skirts off. It’s fantastic! Thanks for joining the Top of the World Style linkup party.